Frontex is exploring the surveillance capability of medium-altitude, long-endurance RPAS as well as evaluating cost efficiency and endurance. 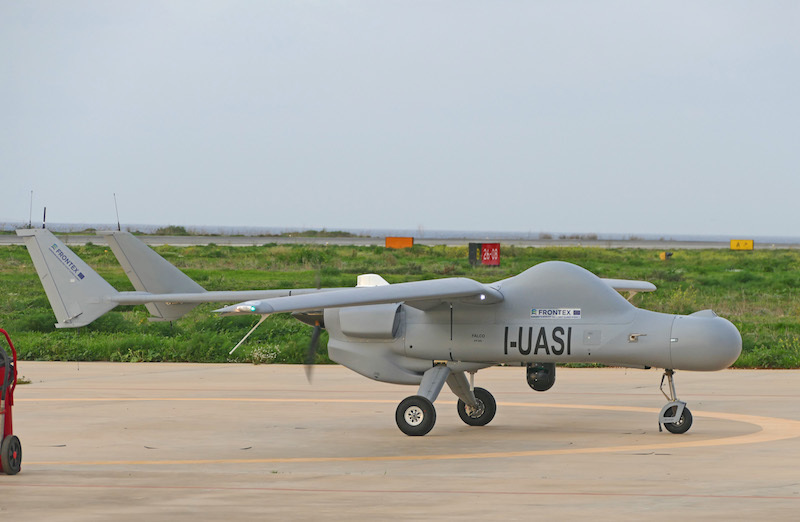 Leonardo was selected by the European agency under a service contract tender for drone operations for maritime surveillance across the Italian and Maltese civil airspace. The current agreement provides for 300 flight hours and may be extended into a longer-term agreement. Under the deployment, Intelligence, Surveillance and Reconnaissance (ISR) activities are organised by Guardia di Finanza under coordination of the Ministry of Interior and are undertaken by Leonardo from Lampedusa also thanks to the decisive support and collaboration of ENAC and ENAV. Leonardo’s flight crews and maintenance teams are present to support the operations with the Falco EVO, which is equipped with a complete on-board sensor suite including the Company’s Gabbiano TS Ultra Light radar. This configuration allows it to carry out extended-range day and night-time missions. The Falco EVO will operate under a “Permit to Fly” issued by the Italian Civil Aviation Authority (ENAC), which authorizes flights in the Italian and Maltese Flight Information Region (FIR)’s civil airspace. The innovative agreement reached with ENAC guarantees compliance with national and international regulations and coordination with relevant authorities. The agreement also provides for close involvement from the Guardia di Finanza as subject matter experts with operational experience in defining mission profiles and ensuring the best operational conditions in which to undertake the 300-hours test programme. The Falco EVO configuration being deployed includes a high-definition InfraRed (IR) electro-optical system, a Beyond-Line-Of-Sight (BLOS) satellite data-link system, a new propulsion system based on a heavy-fuel engine, an Automatic Identification System (AIS) and a complete communications relay suite. Leonardo is the only European company providing a comprehensive RPAS ISR capability, from the design of each system element all the way through to operations. Today the Company is an international pioneer in the operation of unmanned flights on behalf of civil organizations in “non-segregated”, transnational airspace. Under an innovative business model, Leonardo owns and operates its Falco family of RPAS and provides surveillance information and data directly to its customers. This ‘managed service’ model is expected to be an area of growth for Leonardo which is expanding its ‘drones as a service’ offering to customers such as the police and emergency responders in line with the growth path outlined in the Company’s industrial plan.